Ambassador to Kuwait, Shamir Ally. 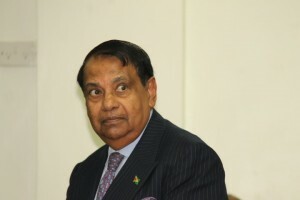 Guyana’s Ambassador to Kuwait, Dr. Shamir Ally did not inform authorities about fraudulent adjustments of a company’s accounts at the United States Securities and Exchange Commission and it went undetected during the screening process. “The fact that it was not done by him did leave us somewhat surprised by this, but that does not necessarily mean that he should necessarily be guillotined for,” Leader of the Alliance For Change (AFC), Khemraj Ramjattan told a news conference. He says fact that it was a civil regulatory case and that Ally is highly qualified should be taken into consideration by the Ministry of Foreign Affairs in its investigation “I am absolutely certain that it will be a consideration in the pot of considerations as it were…These are complex issues that I do not know about in American law that we would have to clear the air on, but yes indeed it could very well be a consideration that might very well veer us one direction as against another,” he said. 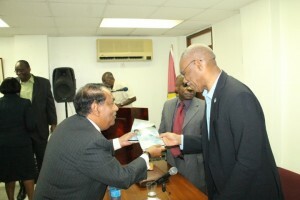 Ambassador to Kuwait, Shamir Ally presenting a publication to President David Granger. Partly hidden is Foreign Affairs Minister, Carl Greenidge. The AFC leader appealed to the media to report responsibly on the matter. Ramjattan said he was certain that Ambassador Ally would explain to Minister of Foreign Affairs, Carl Greenidge what happened. “We have been also indicating to him that he has to also ensure that this investigation proceeds as expeditiously so that we can make a decision as regards that,” the AFC Leader said. Ramjattan said the legal regulatory sanction that Ally had faced back in 1999 has never resulted in his voting rights being taken away and prohibit him from serving as a Notary Public and on various town boards and committees in North Carolina. Records show that on March 4, 2003, United States District Court Judge Michael M. Baylson entered final judgments against A. Robert Mancuso, Ronald R. Lanchoney, and Shamir A. Ally, enjoining them from future violations of the antifraud and record keeping provisions set forth in the Securities Exchange Act and from future aiding and abetting violations of that law. The final judgments prohibited Mancuso and Lanchoney from acting as an officer or director of a public company, and imposed civil penalties of $50,000 against Mancuso, $10,000 against Lanchoney, and $10,000 against Ally. The defendants consented to the entry of the orders without admitting or denying the Commission’s allegations in the action. The Commission’s complaint alleged that the defendants were involved in the dissemination of false financial information by Acrodyne Communications, Inc. in press releases and Commission filings in 1998, 1999 and 2000. The Commission alleged that Mancuso (Acrodyne’s former CEO and president), Lanchoney (Acrodyne’s former CFO), and Ally (Acrodyne’s former controller) were aware of numerous and significant problems with Acrodyne’s accounting controls, but failed to assure that Acrodyne’s financial transactions were accurately recorded. The Commission claimed that, as a result of the actions of Mancuso, Lanchoney and Ally, Acrodyne engaged in inaccurate and improper cost accounting and revenue recognition. The Commission also alleged that, starting in the second quarter of 1999 and continuing through the first quarter of 2000, Ally directed that unsupported journal entries be made to the cost of sales and inventory accounts to bring Acrodyne’s financial statements in line with the gross margin percentage he had estimated for period. The Commission claimed that Mancuso approved these fraudulent adjustments for the first quarter of 2000. Ambassador Ally, an AFC financier and North American Diaspora organiser, was selected by his party to take up the post as Guyana’s top diplomatic envoy to Kuwait.